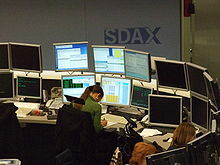 An electronic trading platform being used at the Deutsche Börse. An electronic trading platform, also known as an online trading platform, is a website or computer program with a graphical user interface used to trade financial assets via an electronic communication network, stock exchange, alternative trading system, crossing network, or dark pool with a financial intermediary such as a stockbroker, investment bank, or broker-dealer, or directly with market makers or other participants. Financial products commonly traded include stocks, bonds, currency, exchange-traded funds, commodities, and derivatives. Such platforms allow transactions to be executed from any location and are in contrast to trading via open outcry. Electronic trading platforms typically provide trading tools such as market data, charting, news, account management, analyst research, and customized backtesting. They may also be designed to automatically execute transactions based on a trading strategy such as those using technical analysis, fundamental analysis, algorithmic trading, or to do high-frequency trading and day trading. Direct access trading allows for trading directly with a market maker or specialist via an electronic communication network. This method of trading, which is offered by only a few stockbrokers, such as Interactive Brokers allows for a faster order execution; however, commissions from these brokers on larger trades may be higher since these brokers do not receive payment for order flow. A single dealer platform, commonly used for trading in the foreign exchange market, is a portal by which traders are granted access to prices from one dealer. Before the 1970s, transactions were handled manually, with a stockbroker or a counterparty via open outcry. In 1970, Multi-Access Interactive Time-Sharing Systems made investment tools widely available to stockbrokers. The first electronic trading platforms were typically associated with stock exchanges and allowed brokers to place orders remotely using private dedicated networks and dumb terminals. Early systems would not always provide live streaming prices; orders were entered as request for quotations. In 1971, NASDAQ was founded as a computerized trading platform; moving away from the use of stock certificates. In 1985, William A. Porter founded Trade*Plus (now E-Trade), which offered an electronic trading platform via America Online and Compuserve. In August 1994, K. Aufhauser & Company, Inc. (later acquired by TD Ameritrade) became the first brokerage firm to offer online trading via its "WealthWEB" platform. In January 1996, Transterra launched Accutrade for Windows (now TD Ameritrade). ^ CHEN, JAMES (July 23, 2018). "Direct Access Trading - DAT". Investopedia. ^ "Single-dealer versus multi-dealer platforms". Forex Report. ^ a b Juds, Scott M. (April 15, 2018). Conquering the Seven Faces of Risk: Automated Momentum Strategies that Avoid Bear Markets, Empower Fearless Retirement Planning. BookBaby. ^ Weinberg, Neil (October 1, 2001). "After the Bubble". Forbes. ^ "Leveling the Playing Field: A Q&A With Nomics CEO Clay Collins". Medium. August 29, 2018. ^ Kamen, Ken (September 2, 2010). Reclaim Your Nest Egg: Take Control of Your Financial Future. John Wiley & Sons. This page was last edited on 17 April 2019, at 23:28 (UTC).